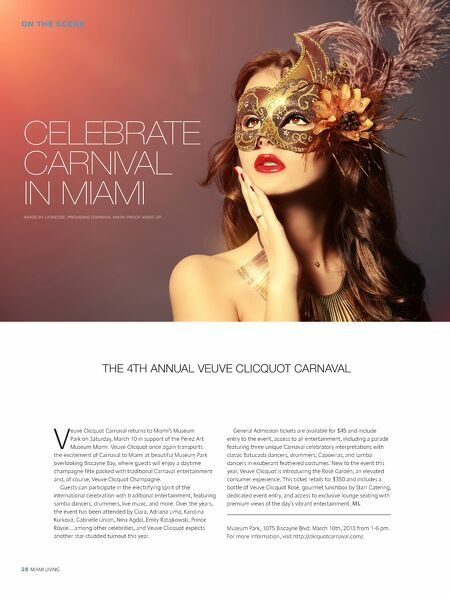 Celebrate Carnaval in Miami THE 4TH ANNUAL VEUVE CLICQUOT CARNAVAL Veuve Clicquot Carnaval returns to Miami's Museum Park on Saturday, March 10 in support of the Pérez Art Museum Miami. Veuve Clicquot once again transports the excitement of Carnaval to Miami at beautiful Museum Park overlooking Biscayne Bay, where guests will enjoy a daytime champagne fête packed with traditional Carnaval entertainment and, of course, Veuve Clicquot Champagne. Guests can participate in the electrifying spirit of the international celebration with traditional entertainment, featuring samba dancers, drummers, live music, and more. Over the years, the event has been attended by Ciara, Adriana Lima, Karolina Kurková, Gabrielle Union, Nina Agdal, Emily Ratajkowski, Prince Royce… among other celebrities, and Veuve Clicquot expects another star-studded turnout this year. General Admission tickets are available for $45 and include entr y to the event, access to all enter tainment, including a parade featuring three unique Carnaval celebrator y interpretations with classic Batucada dancers, drummers, Capoeiras, and samba dancers in exuberant feathered costumes. New to the event this year, Veuve Clicquot is introducing the Rosé Garden, an elevated consumer experience. This ticket retails for $350 and includes a bot tle of Veuve Clicquot Rosé, gourmet lunchbox by Starr Catering, dedicated event entr y, and access to exclusive lounge seating with premium views of the day's vibrant enter tainment. ML Museum Park, 1075 Biscayne Blvd.March 10th, 2018 from 1-6 pm. For more information, visit clicquotcarnaval.com.